Toyota Manila Bay Corporation (TMBC), one of the top dealer groups under the Toyota brand in the country spices up the yuletide season for Toyota buyers with Superb Christmas Blowout sales event in their five dealer locations. 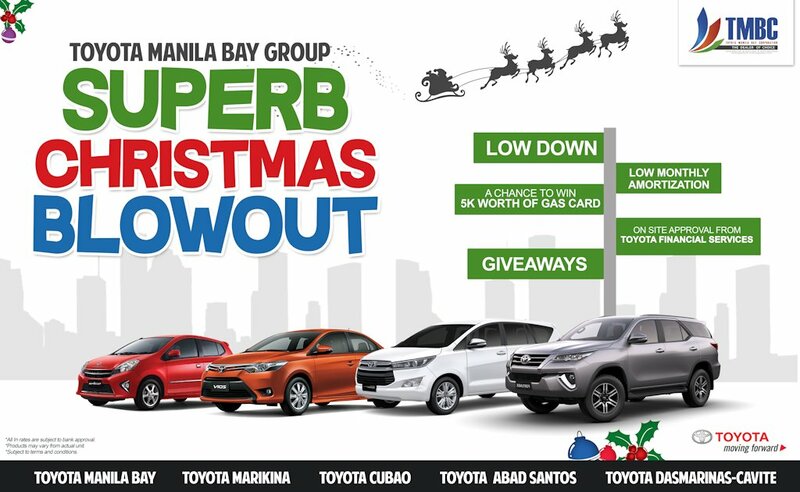 TMBC looks to make the holidays merrier for their customers via their weekend event happening simultaneously across their five dealer locations – Toyota Manila Bay (TMB), Toyota Dasmarinas-Cavite (TDM), Toyota Abad Santos TAS), Toyota Cubao (TCI) and Toyota Marikina (TMK). The event is happening today until tomorrow for Toyota Dasmarina-Cavite, Abad Santos, Cubao, and Marikina and from today until Sunday at Toyota Manila Bay. During the event, customers availing of new vehicles will be treated to special holiday rates exclusive to the dates as well as freebies and discounts. The event will be done in partnership with Toyota Financial Services (TFS) which ensures that the application process for financing purchases will be smooth and fast for interested clients. TFS will also have special treats in stored for clients on the event dates. TMBC offers a complete line of Toyota services from vehicle sales, service and parts, insurance, certified pre-owned vehicles and trade-in.